MELBOURNE, Australia — More homes were being threatened Tuesday by wildfires that have burned dozens of homes and buildings in rural southeast Australia. Victoria state Emergency Management Commissioner Andrew Crisp said emergency warnings were issued for the towns of Dargo and Licola east of the state capital, Melbourne, as flames approached homes. Since Friday, 38 fires have razed more than 40,000 hectares (150 square miles) of forest and farm land across the state, destroying nine homes, damaging another house and damaging or destroying 23 outbuildings. The Jinks Creek Winery was among the buildings destroyed. "We have literally got hundreds and hundreds of firefighters working on the ground, doing their absolute best to keep our communities safe," Crisp told reporters. 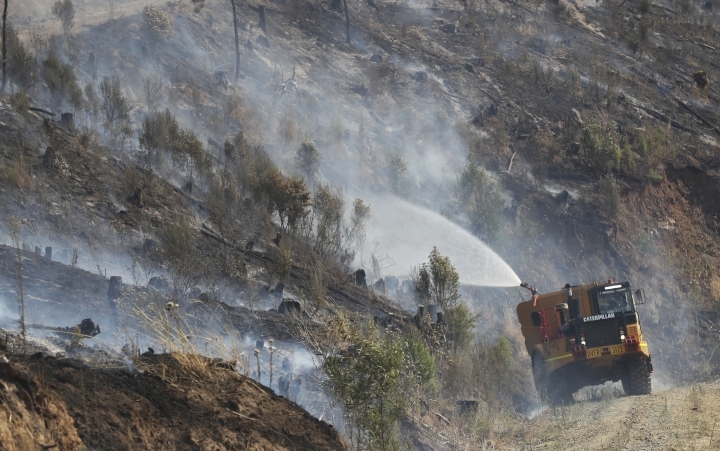 The fires were also being fought from the air with 75 airplanes and helicopters dumping water. Wildfires are common across subtropical Australia during the southern summer, which ended last week. Victoria often has some of the nation's most dangerous wildfires. A month ago, Victorians marked the 10th anniversary of the Black Saturday, a day of catastrophic wildfires that killed 173 people and razed more than 2,000 homes on Feb. 7, 2009.